Get three in a row! That's the goal of this bonus round. Inspired by a fanwork event type called kink bingo, this round encourages you to create and fill out themed prompt cards. Please read this whole post before commenting to ensure that your team gets the most points possible. There's a lot of text here, but if you read carefully and follow the instructions step by step, you will be okay. Please refer to the first comment thread of this post for an example of how this round works. 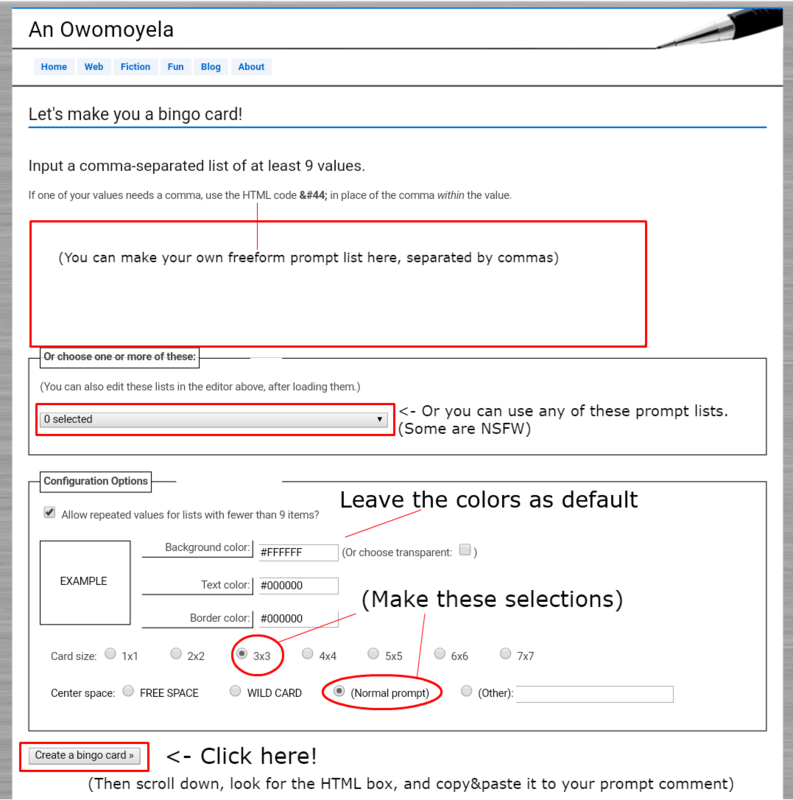 Select a ship to create your prompt card about. Platonic relationships are indicated by an "&" between the names (e.g., Haruki & Kazuma). Non-platonic relationships use "/" (e.g., Haruki/Kazuma). Please don't say "Any pairing," either! Here is a visual guide to using it. The large text box is where you can list prompts if you have your own ideas. Please list at least 9 prompts; you can list more if you want. (The generator says you need at least 24, but it's lying.) Single words or short phrases are better than sentences. Otherwise, you can use the dropdown menu found right below it. Note: some of these prompts lists are NSFW. (NSFW prompts are a-ok as long as you tag for it.) If you don't like some of the options that appear in a prompt list, you can delete them. Text prompts only, please. Also, each card square must be unique—don't list the same prompt 9 times. In "Configuration Options," make sure you select 3x3 and (Normal prompt). This is the most important step! Leave the tic-tac-toe card with its default colors, so everyone can read it clearly. Click the "Create a bingo card" button. Scroll down to see the card that was created for you. If you don't like the prompts it picked, you can reroll by clicking "Create a bingo card" again. When you're satisfied, scroll further down the page until you see a textarea box full of HTML. Copy and paste the HTML from the box and into the body of your prompt comment, then post! Fill prompts by selecting an individual square to create fanwork for, then leaving a responding comment to the prompt with your newly-created work. (Optional:) If you can fill three squares from a prompt in a horizontal, vertical, or diagonal line, you get a tic-tac-toe (and an additional point bonus)! You can also just fill prompts as you please and get standard points. If you're trying for tic-tac-toe, you cannot combine squares into one fill. If your fill can satisfy multiple squares, pick the most relevant square: e.g., one square is sailing and another is pirates and you make a fill about pirates sailing, it's mostly pirates so put down the pirates square. Each fill must stand alone as an individual piece, but all your fills can slot into a larger universe if you'd like. You cannot fill a prompt square more than once, but you can fill every square on a tic tac toe card if you want to. You cannot work with your teammates to get a tic-tac-toe. Only individually achieved tic-tac-toes get the bonus. Multiple people can fill the same prompt square. You cannot "block" others from getting tic-tac-toe. Remember to also follow the general bonus round rules, outlined here. Replace [SQUARE] with the specific square you're filling (e.g., B2). Click here to see a comment thread example of which square is which. "Morning, Otabek!" he calls and hands Otabek his skate guards, then holds out a flask for Otabek to take. Otabek always takes the flask, nodding instead of speaking. It's filled with coffee, even though Otabek prefers tea. It's "JJ Style", cream and sugar, even though Otabek prefers it black. He shrugs into his jacket and drinks the coffee anyway, watching the first ten minutes of JJ's practice, the same way JJ watches the last ten minutes of his. JJ always warms up with the serpentine, over and over, the least flashy thing Otabek has ever seen him do. Otabek doesn't know why JJ learned figures in the first place and he doesn't ask, just drinks the sweet milky coffee and listens to the scrape of JJ's blades on the ice until the flask is empty. He leaves it on the bench beside JJ's bag. When Otabek goes to the gym to train, JJ always heads over with him, arm over Otabek's shoulders while they walk the two blocks from the rink in the summer heat. JJ puts in headphones while he runs the treadmill, singing along with music no one else can hear. People on other treadmills push their own earbuds deeper and click up the volume, staring at the screens in front of them. Otabek clicks up his volume too, except for when he turns it down instead, listening to JJ's favourite new song, like karaoke but without the music. In the weight room, JJ asks Otabek to spot him while he works his arms and Otabek does, looking down at JJ's face, shining with sweat and grimacing as he lifts in a way Otabek is sure is exaggerated. Then JJ returns the favour, cheering Otabek on like he's his personal trainer. Otabek keeps his face straight, no grimace, no smile. But he's lifting more than he used to. When JJ invites Otabek to dinner with his family, Otabek tries to think of how to refuse but he can't get the blunt "no" out of his mouth and he can't come up with any other way to say it. So he ends up at the noisy table with JJ's noisy siblings, holding hands for family prayer before they eat. JJ's fingers wrap firmly around Otabek's and after the bowed heads come up, JJ gives Otabek's hand a squeeze before he lets go. "Speak English," JJ's mother says, but the kids keep slipping back to French and Otabek is just as happy not to have to talk. "I'll drive you home," JJ says, two excruciating board games later. He sings along with the music in the car, the same song he's been looping in the gym, and Otabek finds himself humming it too. When they pull up to Otabek's apartment, JJ turns to him. "Otabek," he says and nothing more, an odd look on his face and a strange feeling in the air between them. "Thank you for dinner," Otabek says and gets out of the car. In bed, he lies awake, thinking about JJ's hand at the table, JJ's face in the car. When Otabek gets off the ice in the morning, JJ is hanging over the boards, holding Otabek's skate guards and waving, the flask of coffee resting beside him. Otabek's heart gives a huge squeezed beat and sweat springs up on his palms inside his gloves. He skates over to JJ and instead of taking the skate guards, he takes JJ's face in his hands and kisses him, one long press of their mouths. When he pulls back, JJ's face is red and smiling. "Morning, Otabek," he says and leans in for another kiss, dropping Otabek's guards onto the ice and winding his arm around Otabek's neck. JJ's first serpentine is wobbly but he settles into the next one, looking up for one more wave at Otabek before his face goes serious. Otabek watches him, sipping at the coffee, and the flask is long empty before he finally turns to go. this is so cute! thank you! idk why i'm just trash for jjbek these days. I'm so glad you liked it! Same same re JJBek. I fell so hard. And it seems like so many people I know are getting on board!